The DJI Ronin-S is more than just a miniaturized version of the larger Ronin gimbal stabilizers; it represents a scalable ecosystem for integrating DSLR and mirrorless cameras into professional-grade workflows. The single-handed form factor of the Ronin-S lends itself to lighter camera payloads, up to eight pounds. But don't let its size fool you; the Ronin-S has a lot going on under the hood. Separate modules are available for the handle and accessory docks, allowing you to customize the gimbal based on how you wish to operate it. While using the conventional battery grip, the Ronin-S will last up to 12 hours on a single charge. 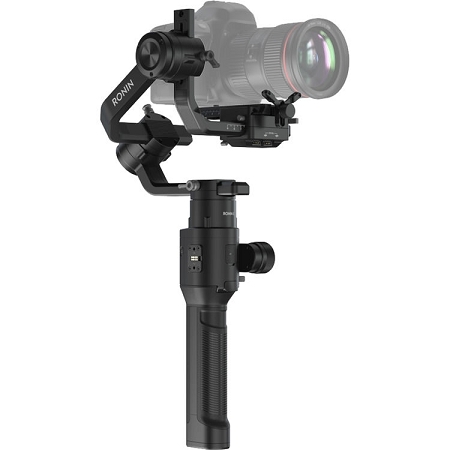 Everything you need to get started shooting with the Ronin-S comes with the gimbal. A sliding camera mounting plate for attaching your camera and balancing works with the included lens support and riser to secure your mirrorless or DSLR camera of choice. USB Type-C and Type-B cables are included for camera control functions like start/stop and focus pulling (depending on camera compatibility). A 24W USB charger is included for quick-charging the gimbal. The gimbal and all included accessories can be stored inside the included case, which helps protect your equipment during storage and transport.